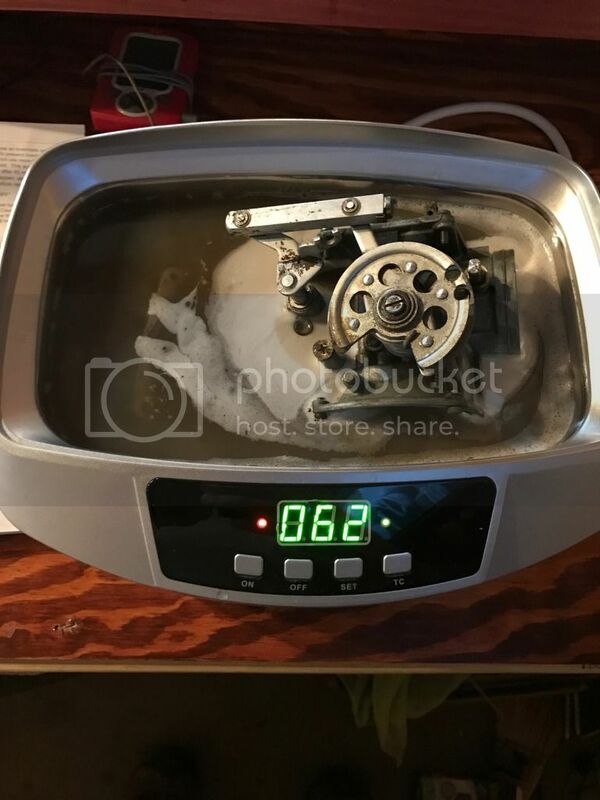 Completely disassemble the carbs, fill the ultrasonic cleaner with Pine Sol (you can dilute it, but you don't have to), put the parts in, then let it run. I've had decent results with the paint can of parts cleaner that Autozone and places like that sell, but I feel like they sludge up too much. 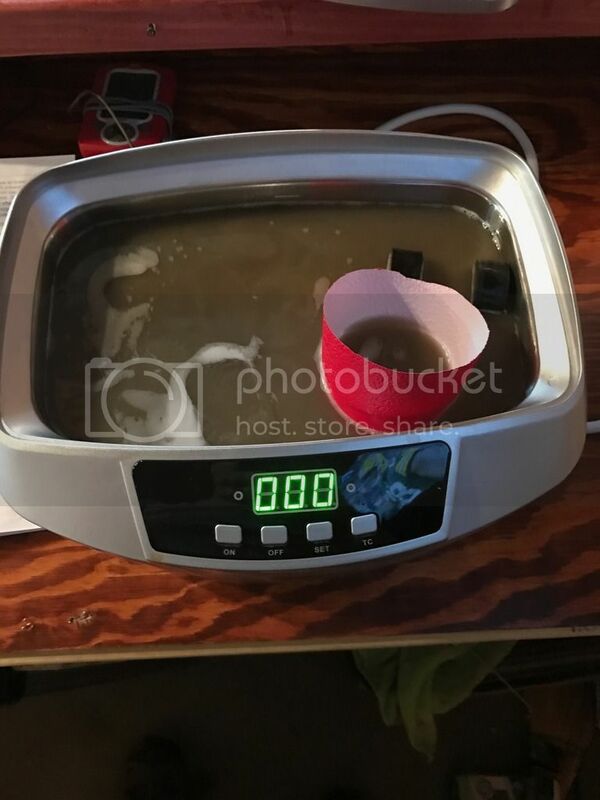 Alright, I picked up an ultrasonic cleaner yesterday and cleaned the carbs with Pine-sol. It worked pretty dang good. I ran into two things during final disassembly of the carbs that I need some help on. The right side carb had been taken apart before from the looks of it. 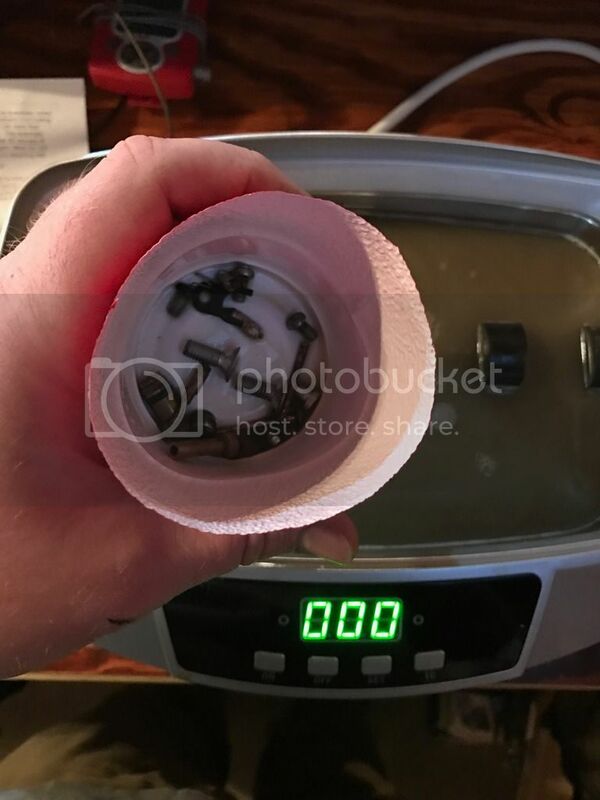 The brass pin that holds the float in on the right side carb is bent. The thing was a bear to get out, so I may have bent it further when removing it. What are my options here? I forgot to get a picture of it, I might be able to bend it back in the vice but that doesn't seem promising. 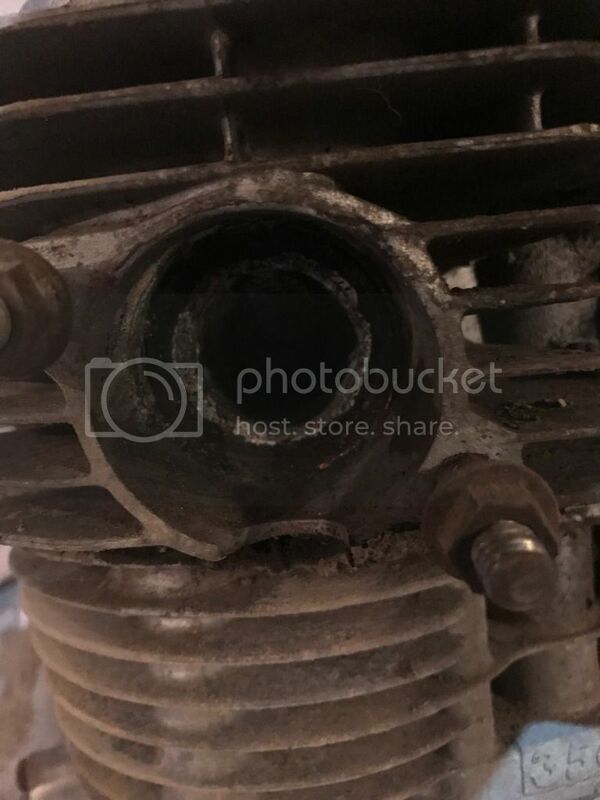 Second, the spring on the little flapper thing on the choke side of the right side carb is broken. The flap moves freely with no resistance. The left side carb the flab stays shut, but does open when pushed on. Again, what do I need to do here? Ebay time to try and find a spare carb? I didn't have time to get the motor out of the bike this weekend but it's almost ready. Going to try to get it done tonight. For the choke flapper, you could source another spring. 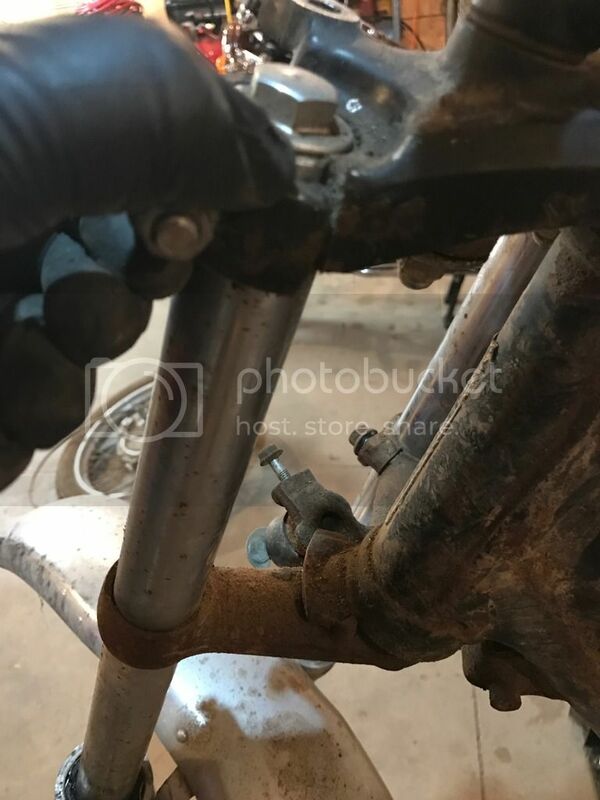 I had this same issue on one of my carbs, but I just bent the end of the spring straight out so that it would be in contact with the flapper. It doesn't need much spring pressure, just enough to return to flat. 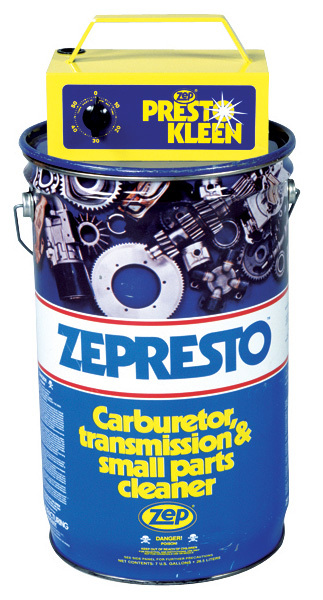 best damn carb cleaner for internal parts you can buy over the counter period. 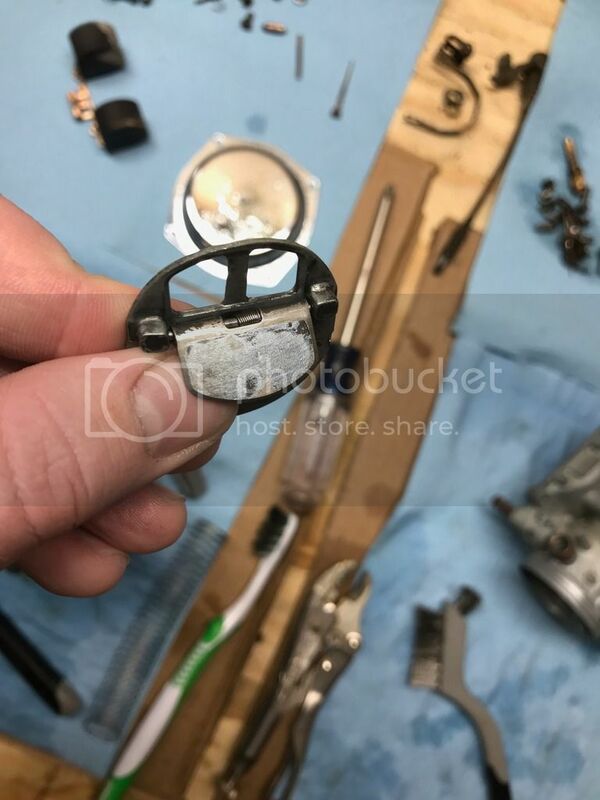 The spring as mentioned can be fixed by inspecting the other to see in what clock position you need to bend a stop leg out then reinstall, its a choke and most don't even have a anti flood door so spring tension is not a concern. Common-Motors was awesome enough to send me a float pin for free for my carbs so I got that covered. Those guys are awesome over there. 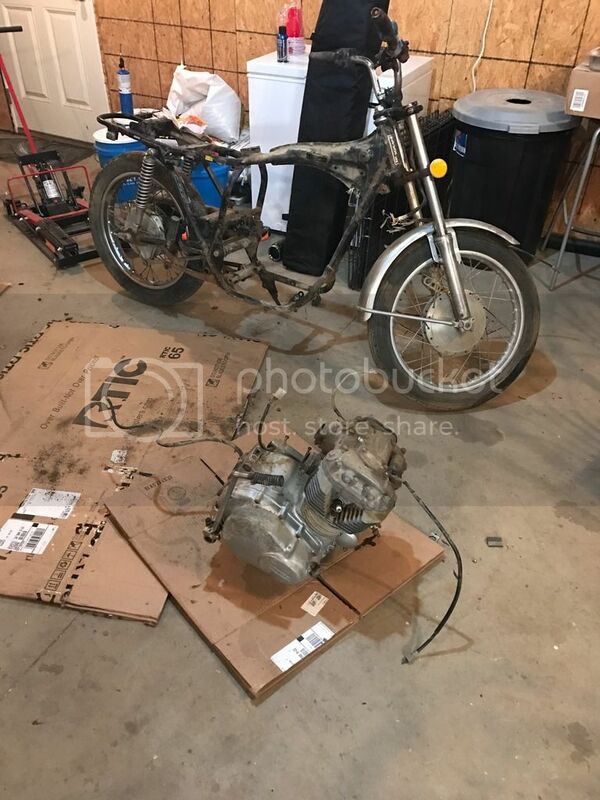 Anyways, I got ahold of CrazyPJ and am going to send him my carbs to rebuild and modify to run pods. I figure I will let someone who knows what they are doing put them together so I know it's done right. I was able to get the motor out of the bike Monday night. I've been traveling for work all week so I haven't had time to update my thread. Here are a few pictures. Notice the right side exhaust port has some pretty heavy corrosion. I'm trying to decide if I should just tear the top end apart and clean/rebuild or just leave it as is, adjust valves/timing/cam chain tensioner, and hope it's all good. At the end of the day it's not that big of a deal to pull the motor out of the frame, so this may be the route I go. I still need to check compression, which I should probably have done before I pulled the motor. 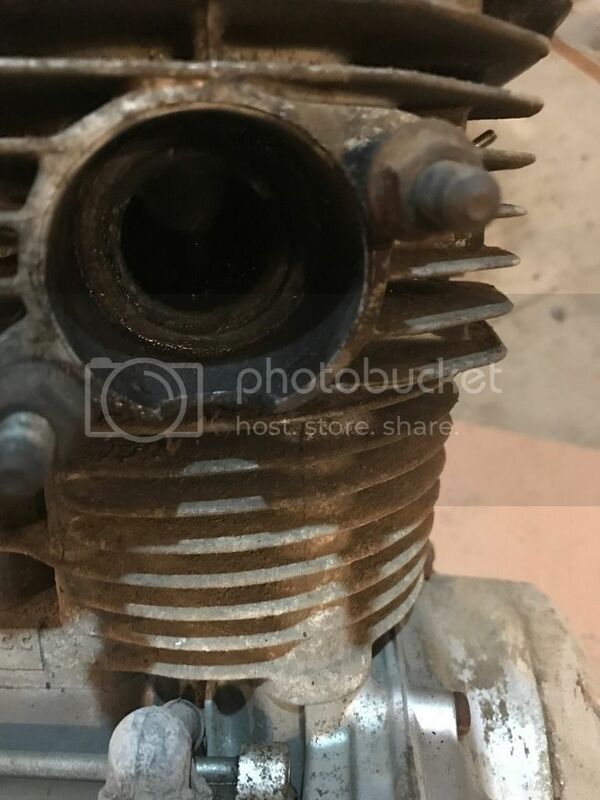 Can this still be done motor out with out to much issue or will it be hard to turn the motor over with it sitting on the bench? Next step is to powerwash the frame and start getting it cleaned it. It's got some rust in spots that need taken care of and some extra tabs and stuff that will be removed. I will probably mock everything back up and make sure the bike runs before I send the frame out for blasting and powder coating. I would hate to have finally assembly go smooth then to have a failure with the engine. I have my stock wiring harness which is in pretty decent shape, although it is pretty dirty and some of the wiring sheathing and connections are fairly brittle. I'm hoping to run some sort of simplified hand controls, gauges, and headlight/turn/taillight, so I'm on the fence about making my own harness. I hate electrical work and chasing electrical gremlins down. I spent sometime trying to find a custom wiring diagram but haven't found what I want yet so I'll keep looking. Thanks everyone for following along with this and for the input. I'd like to have this finished up this summer which I think is a pretty attainable goal. I'm just hoping I don't lose motivation to keep working on it once it warms up and I can ride my other bikes. 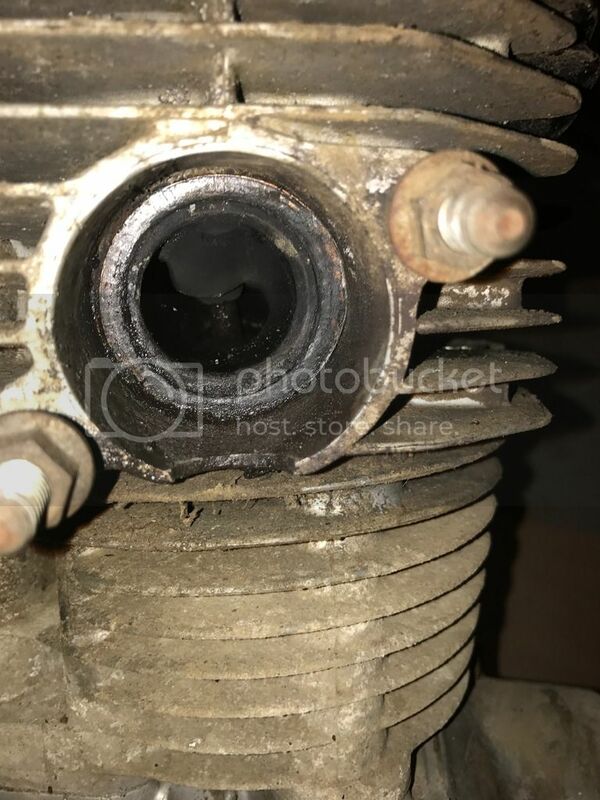 You can still check the compression with the motor out. Just hook the starter up to battery power and spin the motor over. Looks like the carbs are off already, so that's fine. Want those crabs cleaner than the day they were born... RestoCycle is a site supporter and listed jobber on site. http://www.restocycle.com/ I use them when I can and have never been disappointed. Thanks for the good words T-A-F, much appreciated. Looks like you're on your way with your carbs, but I'm at your service if you can use our help refinishing any of that aluminum with our vapor blast service. Links in signature. Thanks for the replies everyone. I got the carbs all cleaned up and put back together and they will be going out to CrazyPJ next week to be moded to run pods. I got the bike down to frame finally and got it power washed. The frame seems to be in pretty good shape, I knocked some rust off at the welds just to make sure there weren't any cracks or anything. Next I'll be knocking off some of the tabs, rear peg mounts, etc, then I'll send the frame out for blasting and powder coating. 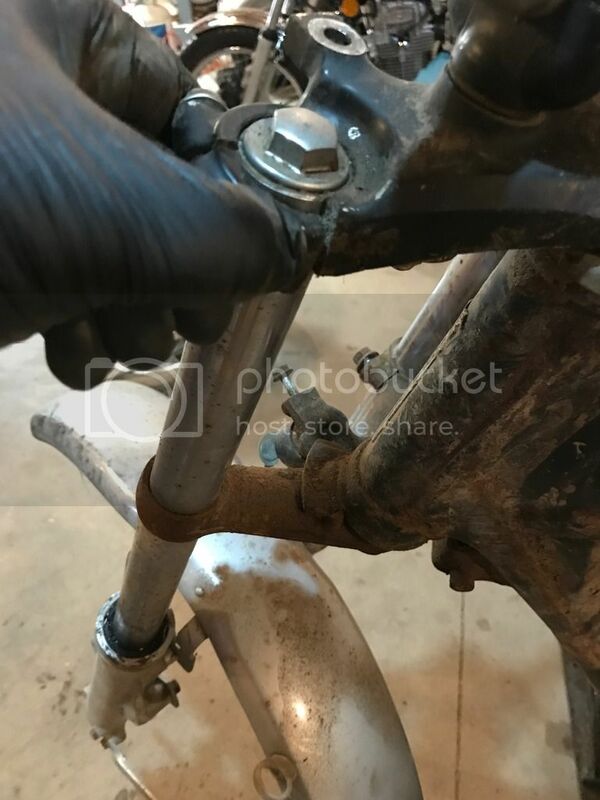 I think I want to use a stock seat set up so I'm going to leave the hinge, and also the raised fender mount. One thing I'm deciding on is if I should remove the rear hoop and buy one from like dime city or something and weld it in. Or could I just weld the stock rear hoop in? I just think it looks a little thin and cheap. 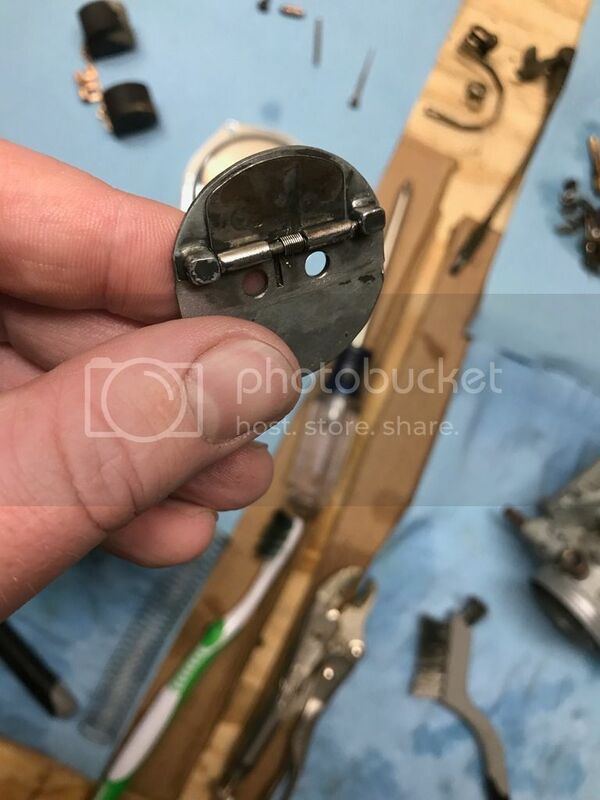 During disassembly last night, I found that the top triple clamp is cracked clear through. So it looks like I will be doing a front end conversion after all. If anyone could walk me through what it would take to swap like a CB750 front end that would be great. Or maybe a CB550 front? If I'm doing it I would like to go to a disc brake in front. What years will work, what will I have to do to the rear suspension, etc? 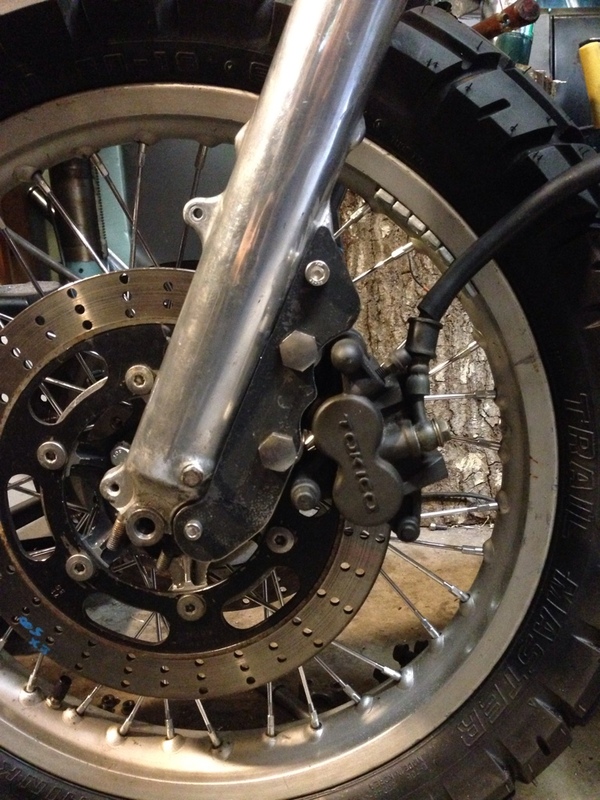 I'd like to be able to keep the stock swingarm because I feel like welding new shock mounting studs is above my head. 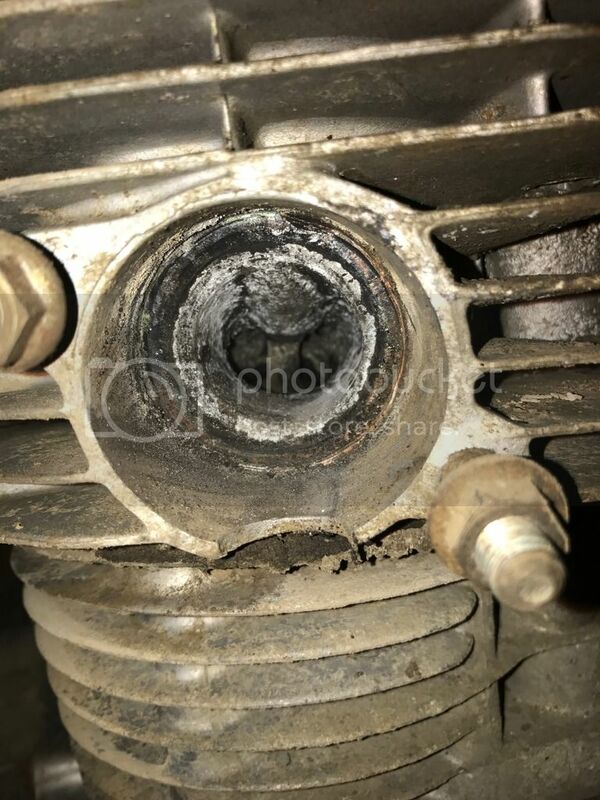 Could I put like a 1" longer shock on the rear and keep close to the same geometry? When explaining this, pretend you're writing a "front end swap for dummies". Sounds about right. These top triples were pretty weak and very commonly overtightened. DCC has pretty nice CNC top triples if you don't want to swap the front end. I'll be watching if you do swap. 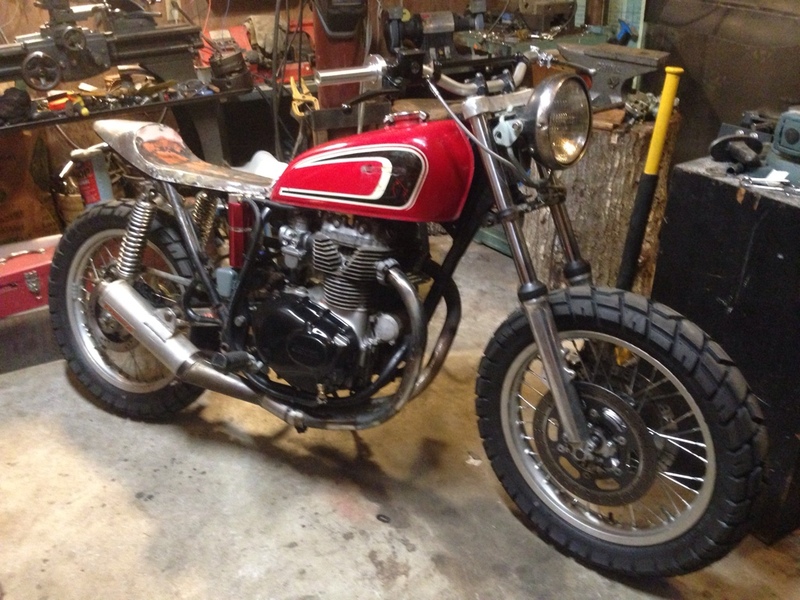 I have been looking at a CB550 front end for my 360 while it's currently off the road. I don't think these guys like me very much or pay attention. HAHA. The swap is literally just bearings and a small 5/8" shim, plus axle spacers. The rotors were made by drilling out the rivets on the stock 360 rotors, taking the stock center and bolting up EX 500 rotors to make sort of a floating disc.